Stars And Garters: Friday Night Fights: Wright - Round 1: Look, Ma! 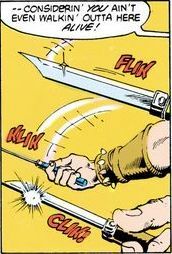 No Hands! Friday Night Fights: Wright - Round 1: Look, Ma! No Hands! 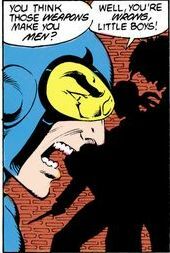 When we last engaged in Friday Night Fights, it was the "Extermination" prize fight where the loser of the round had to either be named after or be an insect. For tonight's first round of the "Wright" bout, I'm flipping things around and this time the winner of my round is named after a bug. 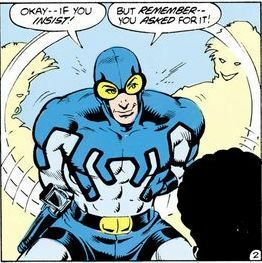 And in the interest of fairness, it's a bug-themed character who was overlooked in "Extermination": Ted Kord aka the second Blue Beetle. 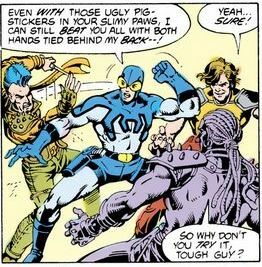 Tonight's Kord confrontation comes from Blue Beetle#9 by Len Wein, Paris Cullins, and Dell Barras. 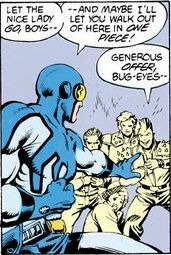 Synopsis: Beetle steps in on three muggers terrorizing and old lady, and he's not having it. That's a big boast! Can Ted do it? ....Okay, OKAY, TED! Close enough! I'll let it slide! Just....don't hurt me! The fight music for tonight's handless hostilities is by Scandal. 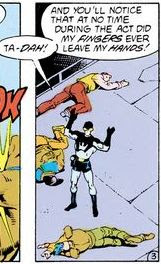 Spacebooger could beat those punks with his hands AND feet tied. Oh Ted! I miss you so much. And that was fabulous.